When you choose to index permissions associated with Oracle Knowledge items, the Coveo connector needs a security provider. When permissions are indexed, in Coveo search results, a user searching for Oracle Knowledge content only sees the content to which he has access in Oracle Knowledge. 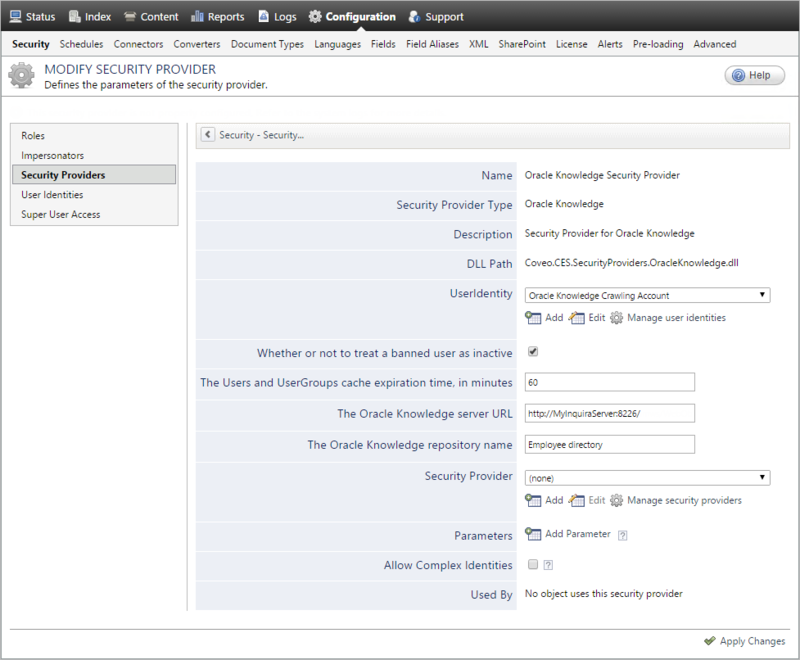 Select the Oracle Knowledge user identity that you created previously (see Oracle Knowledge Connector Deployment Overview) . Enter the URL to the client API web service. The connector auto-filled this URL with /imws/WebObjects/imws.woa/ws/RequestProcessor. Enter the name of the Information Manager repository to index. Note: The repository name is the same value that you enter in the Repository box when you log in to you Oracle Knowledge Information Manager. When you want to index Oracle Knowledge security permissions, select the security provider that you selected or created to allow this security provider to resolve and expand the groups (see Oracle Knowledge Connector Deployment Overview). Whether to treat a banned user as inactive. By default, banned users are treat as active. Enter the time before a cached object is marked as expirated and must be reindexed. The default value is 60 min. Click Add Parameter when you want to show and change the value of advanced source parameters (see Modifying Hidden Oracle Knowledge Source Parameters). Configure and index an Oracle Knowledge source (see Configuring and Indexing an Oracle Knowledge Source).